Migration and medicine will always be close bedfellows. It’s been a fact of life for generations of Irish medical graduates – who originally travelled to the US and Canada, with Australia and New Zealand added as more recent destinations. As graduates of well-established medical schools and with a good grasp of English, many Irish doctors obtain places on sought after fellowship programmes abroad. Of course, medical emigration is a world away from the less fortunate migrant experience. The number of migrants has increased globally by 69 per cent since 1990, and the total is now around 258 million. About a quarter are refugees, fleeing from wars, persecution, famines and other disasters. The rest have mainly left their homes for economic reasons – looking for better jobs and a higher standard of living. While migrants make a largely positive contribution to wealthier countries, immigration is now often seen as a problem, especially in the US and UK. Anxieties about rising immigration have contributed to the election of Donald Trump and the decision of the UK to leave the EU. Most developed countries are highly dependent on their immigrant medical workforce. Roughly one-third of doctors in the USA are foreign-born, while a third of all registered doctors in the UK were trained abroad. In Ireland, the health service, especially the secondary care sector outside teaching hospitals, is entirely dependent on migrant doctors. Many of these doctors fill posts that are entirely service oriented. As such they cannot build up accreditation for higher specialist training that would allow them to progress their careers in a meaningful way. In this respect at least they are more like economic migrants than professional ones. So although these medics have skills that are transferable and valued, they are caught up in the same political and administrative complications that other migrants face. 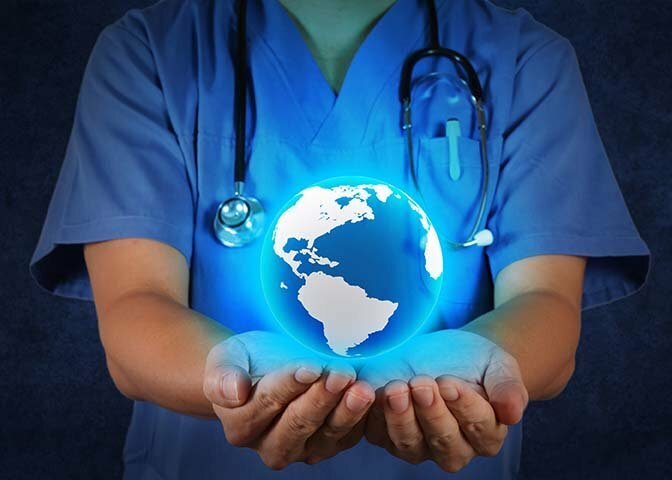 Another important consideration is that the loss of medical talent leads to a sizeable economic loss to the countries that originally trained them. Local health services in their home countries suffer from manpower shortages even though they put in the resources to train these doctors in the first place. A recent review of Migrant architects of the NHS, by postgraduate medical journal columnist John Launer, offers some interesting insights into the immigrant medical experience. A social history of South Asian doctors who entered British general practice during the 1940s-1980s, the book offers a model for making sense of medical migration. Author Julian Simpson, spent a decade carrying out oral history interviews with 40 South Asian GPs. Doctors who qualified in India, Pakistan, Bangladesh and Sri Lanka – representing over 4,000 medics who settled in British general practice- detailed their individual narratives. Almost without exception, the migrant doctors that Simpson interviewed had planned to become hospital physicians or surgeons, intending to carry on doing this in the UK or return as specialists to their countries of origin. But finding themselves in hospital jobs with no prospects they moved into primary care, mainly in deprived urban areas. The circumstances that led to such a trajectory were different for each person, but almost invariably they included institutional discrimination by the British hospital establishment and poor general practice workforce planning. According to Launer, “with little support or encouragement, the doctors moved in to fill a gap that might otherwise have led general practice in much of Britain to collapse. They saved general practice and helped it to develop and thrive”. Sadly these doctors faced less racism from their working class patients than they did from their white medical colleagues. To their credit they became involved in trade unions, local councils and other civic institutions. But UK governments, persistently, gave out confused messages about sustaining the NHS but reducing immigration at the same time. These messages continue to this day. As well as making the doctors appear welcome and unwelcome at the same time, this ambiguous official attitude had other perverse effects. Launer reckons both racial discrimination and a lack of educational support were probably significant factors leading to a disproportionate number of South Asian GPs facing disciplinary proceedings at the General Medical Council. Despite these negative factors the book outlines how these GPs became deeply involved in religious and communal associations or charitable institutions in their adopted country. Launer credits them with having been leaders in promoting multiculturalism and architects not only of the NHS but of postcolonial society as a whole. What does this tell us about the future of the current cohort of immigrant doctors in Ireland? Although we don’t have a colonial history to complicate our relationship, the indications are we will take some of the same liberties with medics from overseas as our Anglo cousins did.